September is National Childhood Obesity Awareness Month, which is a great opportunity to evaluate and improve current wellness policies in order to combat childhood obesity. There is no better place to start than schools. Schools are a major contributor to a child’s dietary and physical activity behaviors (Centers for Disease Control and Prevention [CDC], 2015). In fact, school-aged children spend more than half their waking hours and consume half their calories while at school. Therefore, teachers need to be given the time and resources to incorporate physical activity into the classroom beyond time spent in recess and PE. One in three children, in our country, is overweight or obese, which can lead to an increased risk of type 2 diabetes, high blood pressure and heart disease (“September National Childhood Obesity Awareness Month,” 2016). According to the Alliance for a Healthier Generation, youth need at least 60 minutes of physical activity every day. Incorporating physical activity into the school day can help children meet that recommendation. 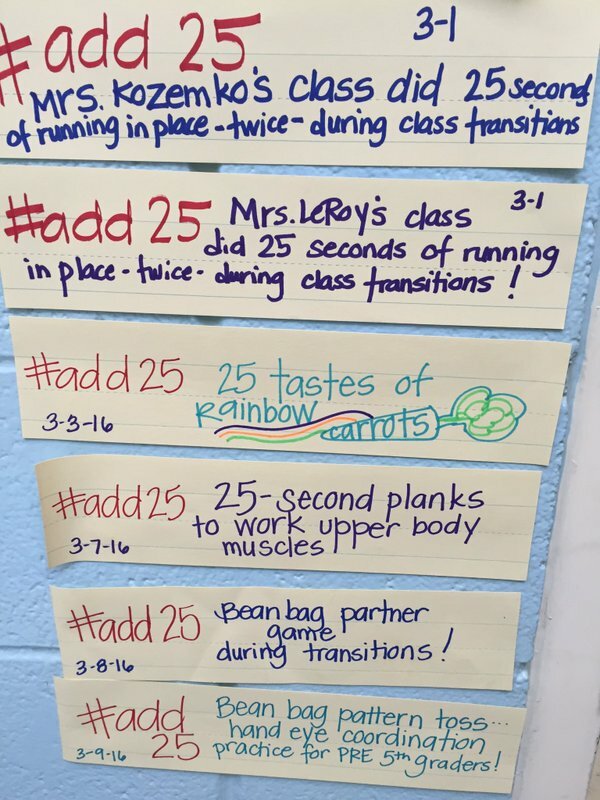 Examples of how teachers build nutrition and physical activity into their lessons plans during the Poe Center’s #Add25 Challenge. A more active brain, in children, after 20 minutes of walking. Additionally, reading, spelling, and math grades were improved, as well as a 16% improvement in memory tasks. One lesson with physical activity increased the students’ physical activity for the week by 13%. A decrease in teachers’ time of managing behavior issues. There are a variety of resources available to help teachers and educators easily build physical activity into their lesson plans and school day. Action for Healthy Kids provides activities teachers may use to engage students, no matter where they are, including the playground, the cafeteria, the classroom, and many more. The Poe Center’s Nutrition & Physical Activity Classroom Calendar is a free tool which features a monthly health topic along with easy-to-use classroom activities, including snacktivities, brain boosters, and links to additional resources. It is easier to establish healthy behaviors at a younger age than to try and change unhealthy ones years later (CDC, 2015). Therefore, it is our responsibility to create a school environment that supports positive health behaviors so healthy children become healthy adults. Bangsbo, J., Krustrup, P., Duda, J., Hillman, C., Andersen, L., Weiss, M., …Elbe, A. (2016, May 10). The Copenhagen Consensus Conference 2016: children, youth, and physical activity in schools and during leisure time. British Journal of Sports Medicine, 1-2. doi: 10.1136/bjsports-2016-096325. Move More and Increase Your Family’s Physical Activity. (n.d.). Retrieved August 30, 2016. September National Childhood Obesity Awareness Month. (n.d.). Retrieved August 30, 2016. Spoon, C. (2015, January 28). Active Living Research. Retrieved September 01, 2016. Whole School, Whole Community, Whole Child. (2015). Retrieved August 30, 2016.